With very little in the way of monuments or structures remaining at the former Expo 86 site, did you ever wonder what happened to it all? Some of the stuff was shipped away -- most of which was sold to companies and government institutions. However, there are still a few reminders of Expo 86 around Vancouver if you know where to look. 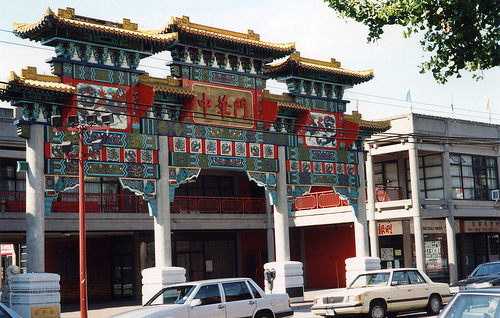 The China Gate -- was donated to the city of Vancouver from the People's Republic of China and was moved to the Chinese Cultural Centre on Pender Street. Inukshuk -- the Inukshuk that stood outside the Norrthwest Territories Pavilion is now sitting on a grassy point on the south side of English Bay. Friendship 500/Mcdonalds -- Nicknamed the McBarge, it was one of the busiest in the McDonalds chain during the summer of 1986. The busiest on record for the year was actually the McDonalds located by the Main Gate due to the fact that it was open early to serve breakfast. 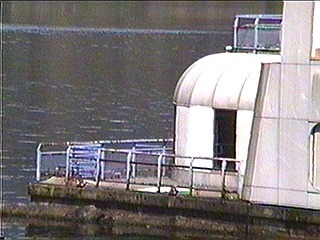 Today the McBarge is abandoned and forgotten. It can be seen anchored in the waters of Burrard Inlet just north of Capitol Hill, Burnaby. Main Gate Circular Portals -- are now situated by the Agradome at Hastings Park. France Pavilion -- Sveral of the Human statue ornaments from the France Pavilion were relocated to the Seven Oaks Shopping center in Abbotsford. (They were flat silhouettes with star fields painted on them) They remained in the food court there until about 2003 when the food court was then demolished and relocated. The statues are nowhere to be found now. 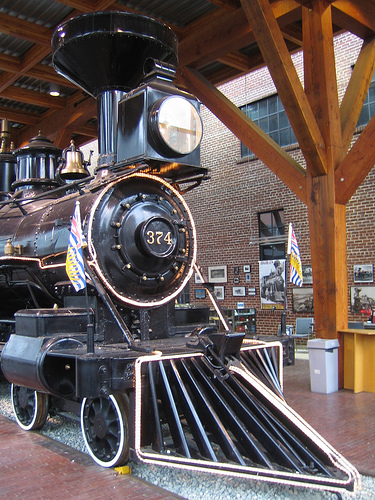 Locomotive #374 -- stood for years rusting away at Kitsilano beach until it was restored for Expo 86. 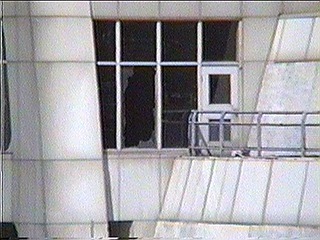 It sat in front of the Roundhouse during the fair and now sits inside the building. The pavilion itself was turned into a community centre. Office Furniture -- much of which came from pavilion offices and the administration centre was either auctioned off or moved to other government institutions. 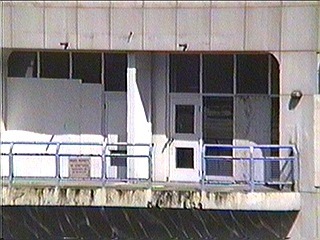 The Mapleridge library (now closed) was furnished ala Expo 86. 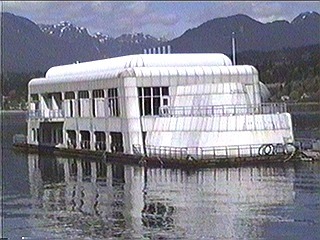 Japanese Restaurant (waterfall building) -- was dismantled and taken to Bowen Island where it has been a personal construction project at 1547 Eaglecliff Road for twenty years. 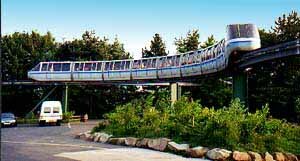 The Monorail -- is now shuttling passengers to and from the parking lot at Alton Towers Amusement Park, England. World's Largest Canada Flag -- is still flying overhead a car dealership in Surrey. Park Benches and Garden Planters -- have been moved to various parks. Hastings Park, site of the Pacific National Exhibition, has many fixtures. 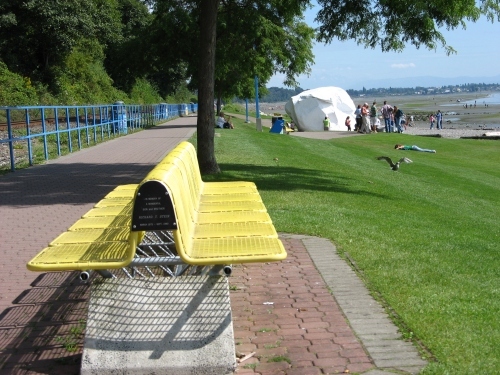 Benches from the Yellow Zone can be found along the boardwalk at White Rock. Cultus Lake has some benches from the blue zone.